The last time I was on as proper sun holiday to Spain, it was all about getting a colour - lying in the sun and properly worshipping (with SPF!). 10 years on, this year's holiday was more about enjoying the heat and outdoors but protecting my skin fully - I didn't go below SPF 20 on my body and 50 on my face....and it was the last 2 or 3 days before the 20 came out for my legs. So fake tan was a reality on the holiday and to kick things off nicely, I decided to get a spray tan before I left. I do my own tan usually but if I have a formal to attend, I get a spray tan because I love the intensity, the evenness and the fact that they last 4 or 5 days really well (for me). But would it work well on holidays? I was flying out on the Friday so had the tan done on Wednesday evening, allowed it to develop overnight and then showered it off on Thursday. It looked fab. 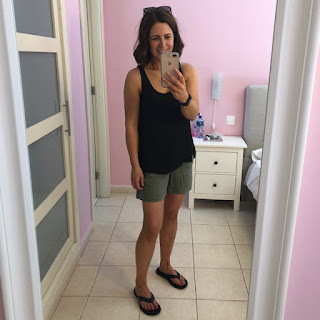 When we arrived on Friday afternoon, I was straight into my summer gear and out to the poolside looking super tanned (if I may say so myself) but I could smell the chlorine in the pool and was reluctant to get in. What if my fresh spray tan just dissolved on me?! I spent a few days dodging the pool as a consequence though I did swim in the sea. This made me feel bad though - the kids were so keen for me to join them in the pool and I was like some sort of high maintenance TOWIE mum. But my comeuppance arrived because after 5 or 6 days, the tan started to patch on me, which is what happens with spray tans and I'm ok with that but of course, when you're on holiday wearing shorts and bikinis every day, you can't disguise the patchiness under jeans or longer skirts like you would at home. So on Day 6, I had to bite the bullet and exfoliate the spray tan off...to find that I was as white as the day before I got my spray tan and looking pretty miserable on it. Luckily, I'd brought a sample sachet of St Moritz self tanning cream which gives instant colour and develops. It took the whiteness off me and actually for a tan I'd never used before, it was quite impressive. Lesson learned? Don't bother with the pre-holiday spray tan. It just looked weird getting paler and paler as the holiday went on. And it was kind of depressing too!! If you're a regular tanner at home, just keep it up on holiday and bring your exfoliator and regular tan product with you. 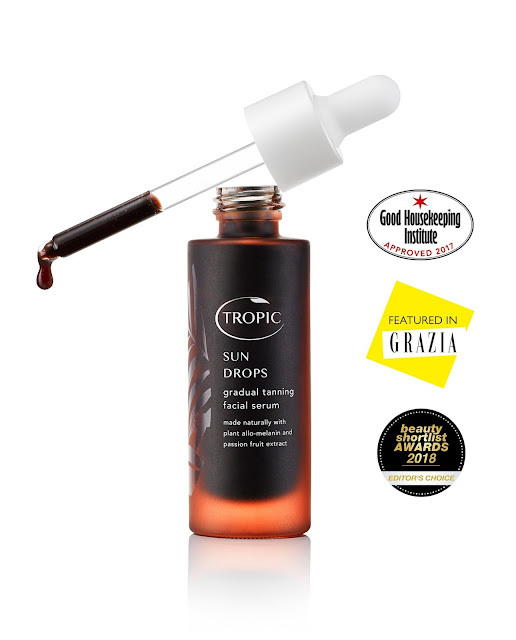 Throughout this, on my face, I used Tropic Sun Drops mixed them with my Epionce SPF 50 every other day. It gave a gorgeous glow and colour. I try to keep facial stuff as natural as possible as I find fake tan so drying and spot-inducing on my face. This doesn't dry out the skin at all and you use only a few drops each time so they last for ages. A first class product from a great company. If I had time, I'd become an ambassador for Tropic - I'd love the consultant discount for one thing! But I can't fit it in so instead, I support 2 lovely ladies whom I've met through the blog and who sell Tropic via their own websites and at pamper parties and fairs etc. I have bought all my products by the way - they've not been gifted. If you're local, I can recommend Kerri whom you can find on Instagram on this link & here's her website. And if you're across the water, Jan has a great Instagram account on this link where she shares products and tries everything out herself. So helpful when you're considering buying something. By the way, I did take a light tan over the course of the 11 days and since I came home, I've been using He-Shi Day to Day Gradual Tan and I'm really impressed. I think it works best where you already have a bit of natural tan - it keeps it glowing for longer. Even when I was in bed coughing like a trooper after the holiday, I kept slapping it on and now, 3 weeks later, I still have a very natural looking tan. Bonus is that it's a local company - in fact, I drive past their factory en-route to my job in Field Day. Bottom line? I'll not be getting a spray tan ahead of a longer sun holiday again. You live and learn as they say! Out of interest has anyone ever tried sun cream with gradual tan incorporated into it?? Do let me know if you have. I feel like it could be an amazing option. Also, I'd love to hear your tanning tips for holidays if you have any good ones?